MP TET Recruitment: Madhya Pradesh Professional Examination Board (MPPEB) has given employment notification for the MPPEB recruitment of Middle School Teacher vacancies under General and Special MP TET Recruitment drive for Govt. of Madhya Pradesh. Applicants who are eagerly waiting for MPPEB Jobs can check latest MP Vyapam Recruitment 2019 on our website. So, MPPEB publishes a notification for MP Vyapam Vacancies. So, it is a good chance for applicants who are waiting for MP Vyapam Middle School Teacher Recruitment can check details on our page. Also, for sake of applicants, we enclose MP Vyapam Middle School Teacher Notification in below sections. Therefore, applicants can go through MP Vyapam Notification 2019, MP Vyapam Syllabus, MPPEB Recruitment, MP Vyapam Middle School Teacher Hall Ticket, MP TET Syllabus PDF and apply before the Closing Date. Also, we provide MP TET 2019 Notification in below sections. Hence, MPPEB is inviting online before the closing date for MP Vyapam Middle School Teacher Recruitment. Also, here we have MP Vyapam Syllabus & Exam Pattern, MP Vyapam Admit Card, MP Vyapam Middle School Teacher Recruitment, MP Vyapam Vacancy Details, MPPEB Recruitment, MP Vyapam Middle School Teacher Syllabus, MP TET Previous Year Question Papers, MP Online Admit Card, MP TET Result, MP TET Eligibility Criteria, MP TET Selection Process, MP TET Recruitment MP TET Exam Syllabus and MPPEB Middle School Shikshak Exam Syllabus details as well. Also, know upcoming MP Vyapam Recruitment 2019 and MP TET Admit Card 2019 immediately here by following our site i.e, www.recruitmenthunt.com. Also, for more further details you can also login to official website i.e, www.peb.mp.gov.in. Graduation and Diploma of two years in elementary education in the respective discipline. The age limit should be 21 to 40 years for Male (Unreserved) candidates. The age limit should be 21 to 45 years for Female (Unreserved) candidates. The age limit should be 21 to 45 years for SC/ ST/ OBC/ PWD candidates. The Selection Process will consist of a Written Test and Document Verification. Those who will qualify in the Written Test will be called for Document Verification. 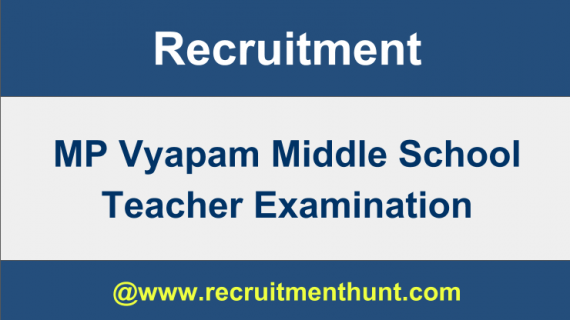 The pay scale for the MP Vyapam Middle School Teacher post is Grade Pay of Rs. 32800 + other allowances. Step 2 – Click on the link “MP TET Exam Notification” and apply for the post which will open a new screen. Step 3 – So, Check MP Vyapam Application Form and fill with complete details. Step 4 – Also, fill MP TET Application form with complete details and upload scanned documents. Step 5 – So, finally submit the MP Vyapam Middle School Teacher Application form and make a fee payment. Step 6 – Furthermore, as a reference, take a printout of Application form for future use. Finally, here we enclose MP Vyapam Recruitment with Solutions. So, contenders can make use of MP Vyapam Middle School Teacher Previous Question Papers while preparing for MP Vyapam Middle School Teacher Exam. Also, keep Searching our site Recruitment Hunt for more Government Job updates. Also, interested individuals can download MP Vyapam Syllabus and MP TET Exam Pattern 2019 here. Also, For more Job updates do subscribe to our site Recruitment Hunt.